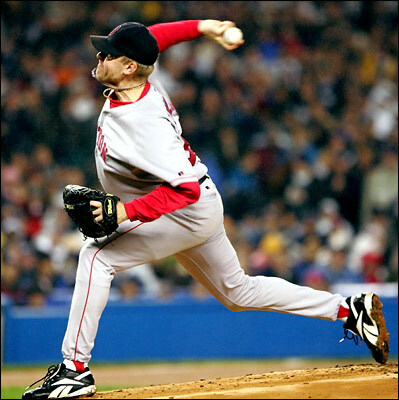 Here's Boston Red Sox ace, Curt Schilling. It's not hard to understand why fair-weather fans like myself return to the old game once the leaves start changing their hue when the weather is not so fair. I spurned baseball when I was a thirteen, having been plunked by too many fast pitches in Babe Ruth little league. I was the type of batter who'd come up to bat with his eyes closed . . . I was that scared of the baseball. Even so, watching the playoffs on television transports me back to the days when I was even younger . . . eight or so. The ball didn't scare me then . . . losing did. Last night's Game 6 had it's own brand of poetry, a type of Epic if you will, spanning from 1918 to present day. No team has ever come back from a 3-0 deficit to tie a series up. And yet, the Red Sox did that very thing on the powerful right arm of a pitcher who was hobbling around on one-leg for the better part of four hours. Schilling's performance was brave, his ankle clearly bleeding through his sock . . .. That was a clear symbol for someone such as myself who fishes for symbolism in almost everything. I had the opportunity to see the Yankees take on the Red Sox last summer with my mother and father. It was their first baseball game. Mike Mussina and Pedro Martinez were facing each other. Hell of a game. It was hot in Yankee Stadium. We were sitting next to a bunch of Red Sox fans who howled the entire game. My parents were thrilled . . . not with the game, but with the fandom. The Red Sox lost in the ninth inning, but the contest between the NY/Boston fans continued well after the game was over, down the stairs, the exit ramps, the streets, and into the subways. There were no fights, but there were several near-fights. There were lively conversations about the game people had just witnessed. My father was particularly tickled about the game. We all came out of the subway and got to our hotel, quite burned from the afternoon sun. My father had a clear line that divided the top of his forehead from the bottom of his forehead from where his baseball cap had been. My mother kept smearing him with an ointment, but she couldn't wipe the grin off his face. We had all seen 55,000 people rapt with passion and shared in that passion for three hours. If you don't understand baseball or sports, surely you understand that one thing. So when I watched the little bit of blood trickle out from Schilling's sock as he left the game in the seventh inning, I knew that the place to be on this Tuesday night was out at Yankee Stadium, mist from the moisture adding to the already chilling 46 and cooling temperature. There were still more innings to go and I was ready for them.